Excerpt from The 4 Laws of Follow-Up Class. What's one of the most important aspects of a business that is often overlooked, misunderstood, or simply not executed well? Follow-up. I ran a poll on Instagram Stories (a great strategy for lead generation by the way) and 76% said they know that their follow-up needs work. 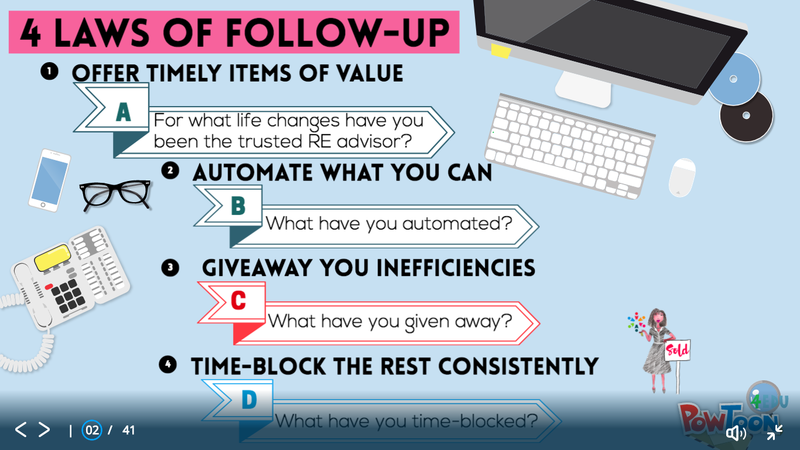 In the prelude to my live class, The 4 Laws of Follow-Up, many of you have expressed how you have seen your network post on social media their latest real estate deal WITHOUT you being their agent of choice. We know our follow-up needs to improve. But, as a #throwback for all my 1980s children out there, "knowing is only half the battle, yo Joe". Let's focus on Law #4, which is to Time-block the Rest Consistently. Here's the thing -- most of us are willing to time block some lead generation, whether you are apt at cold calling, networking, social media and so forth. And for sure, many of us time-block client showings, inspections, closings, and transactional issues. But, it is vital that we specifically time-block follow-up. No, I do not mean we have a chunk of time today that we use for initial cold calls, emails, broker opens/caravans, and other non-follow-up activities. I mean we must specifically have a time set aside to ONLY follow-up, especially if follow-up is your weak link in your business. Add to your calendar a weekly (or daily) time to focus specifically on follow-up. Sound off - I would love to hear from you! Give me a shout on Facebook, Instagram, YouTube, and Google+ or by visiting LearnWithLee.Realtor. Transform your real estate sales game plan with our latest tools for your business, PROFIT WITH YOUR PERSONALITY and the classic workbook PLAN TO WIN! Get your copies today! Is it Time for a Strategy Surge?